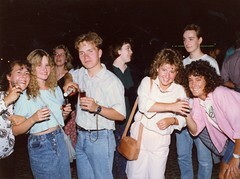 Phyl's Blog: GERMANY 1989, SO NEAR AND YET SO FAR! So often in the years before I'd been in a car that turned inadvertently into a dead end street in West Berlin with that awful wall straight in front of me. I only once went into East Berlin thro' Checkpoint Charlie ,,,with automatic rifles pointed directly at my head as I awaited clearance .,., similarly on a "touristy" walk along the Brandenburg Gate walkkway near Xmas time I had a high power rifle trained on me from start to finish by one of these East Berlin soldier Guards, the guys with the Great grey coats and Russian style fur hat .,.,This gate btw is supposedly a symbol of PEACE ! Not a comfortable experience I can assure you ! But I wouldn't have missed it for anything. Sadly I haven't been back since the wall came down, but one day ?? ?